I treat chili like a stew, meaning I never make it the same way twice. I always include beans, because I try to eat lower on the food chain. 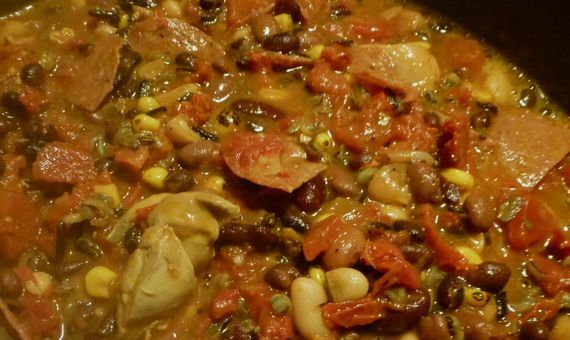 For some people that means my stew is not chili, so, in that case, call it bean stew. Decision One: meat or no meat. If meat, which one or ones? Decision Three: general flavor profile. Mostly chilis. Something more? Both are good, but this changes what you do. Decision Four: to add a grain (or several)—or not. Here’re my usual current trends…. Fry up some good bacon, chopped. Remove the bits, saute chopped onion in bacon grease. Add some garlic and let go for 1–2 minutes. Remove from pan and brown meat if using beef/bison chunks or chicken/turkey. I never use ground meat—although sometimes I do use sausage, which of course is ground meat (ah, complexities). I usually cook one or two grains separately before adding (start the same time you get the bacon out of the fridge). Favorites are barley and wild rice (which can be simmered together). Sometimes I stir in frozen maize just before serving (just give it time to get hot)—and Trader Joes has a frozen roasted corn that adds nice notes. Then add the onions/garlic back in, add some tomatoes (canned, again, are fine), and several cans of beans (rinsed). Delay adding the beans if you are worried about them getting too soft while the rest of the stew is coming together. Now build the flavor. You can add chilis in some form (e.g., raw jalapeños, poblanos, canned green chilis, whatever you prefer). You can add a hot sauce. You can add some Worchestershire sauce, some soy sauce, and maybe some BBQ sauce to round out the flavor. I also often add some smoked paprika. Herbs. Lately I’ve been adding a few pinches of dried lavender. Some oregano. Parsley maybe. Basil. Cumin is an option—more that a little and you will really taste it, which is fine if that’s the direction you want to go—otherwise, you may find it overwhelming. If you’re adding fresh herbs, stir them in (or some of them in) just before serving. My latest new trend is to use the dried tomatoes that TJs sells that are bagged and not packed in oil, and are pliable and tasty. I chop them, then stir them in, adding water or broth to give them enough liquid to soften. Do this when beginning to bring the whole stew together. Salt and fresh-ground black pepper. Serve as is, with a drizzle of oil, some cheese, yoghurt, a side salad (lots of vinegar! ), whatever trips your tongue.